*When it comes to baking, you can be original with flavor ideas, but recipes are chemistry. There is very little originality in baking because the recipes are formulas. The following angel food cake recipe and directions are from Food Network’s Alton Brown, and proved to be very successful for me and for many Food Network Viewers. Carefully spoon mixture into an ungreased tube pan. Bake for 35 minutes before checking for doneness with a wooden skewer. (When inserted halfway between the inner and outer wall, the skewer should come out dry). (It’s me again with the instructions!) 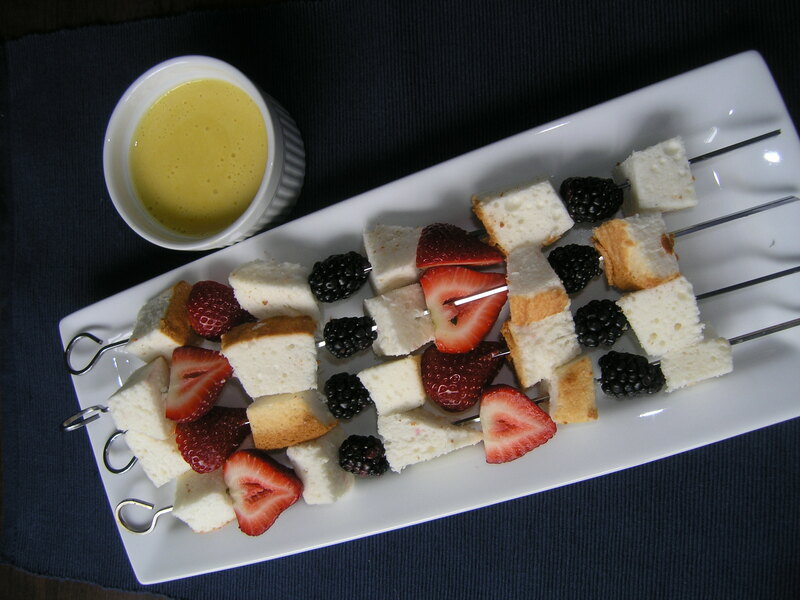 While the angel food cake is cooling, prepare the sabayon sauce. Sabayon is a creamy sauce that is thickened by carefully cooking the egg yolks. Fill a large bowl with about 4 inches of ice and water, set aside. Add the separated yolks and sugar to a medium sized sauce pan. Whisk until the yolks become slightly fluffy. Add the champagne, whisk again, and put the mixture over a double boiler. Begin to cook on medium heat, stirring constantly as the mixture cooks. It will start to thicken. When the texture coats the back of a spoon, immediately set the pot in the ice water. Whisk and whisk until the temperature cools completely. Add the vanilla extract and the orange zest, transfer to a serving bowl, and set aside covered in the refrigerator. 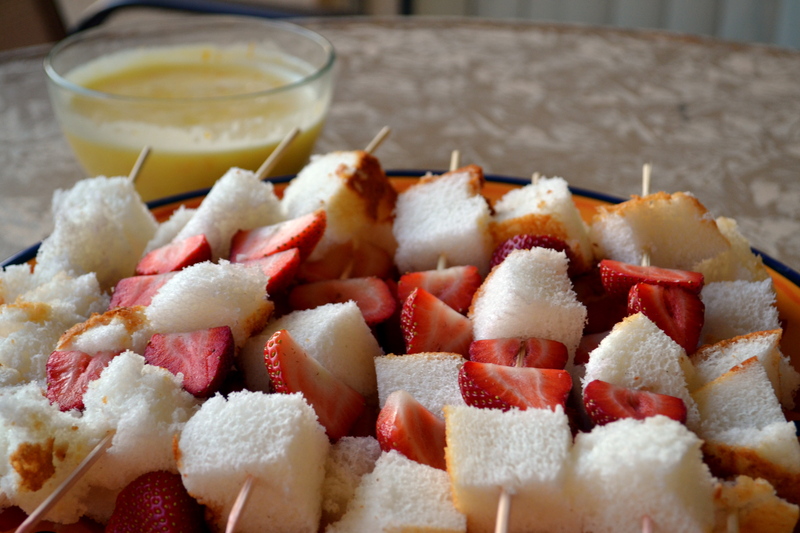 To assemble the kabobs, cut the angel food cake into large, bite-sized pieces. Skewer one piece of cake for every piece of fruit. I made them all the same pattern but I wish I didn’t. I think it stands out when they all look a little different. Serve the kabobs with the chilled sabayon on the side. This looks great and a great summer party dessert. Thanks Jamie!